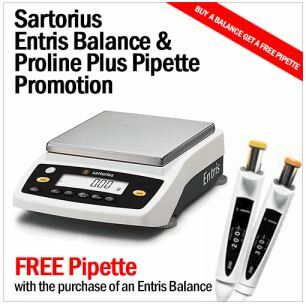 Because of its previous success, Pipette.com is extending the Sartorius Entris Balance promotion which allows customers to buy the balance and get a Sartorius Biohit Proline Plus pipette for free. This is an ideal promotion for academic and smaller size independent laboratories. Offering a complete line of laboratory balances, Pipette.com has extended their Sartorius Entris Balance promotion. The Sartorius Entris Balance is the perfect laboratory balance for customers seeking a durable, high accuracy, and easy-to-maintain balance entry level balance. Entris provides error-free operation with excellent readability. The Sartorius Entris Balance promotion entitles customers who purchase the balance to a free Sartorius Proline Plus pipette. Proline Plus promotes fatigue-free pipetting and prevents the risk of repetitive stress injuries (RSI). It is ideal for every day laboratory applications. Founded in 1996, Pipette.com has over 18 years of experience in the biotech industry. Pipette.com distributes 20+ brands of pipette, 10+ brands of pipette tips, has a comprehensive portfolio of lab equipment, and offers ISO 17025 pipette calibration service. For more information regarding the promotion visit http://pipette.com/SartoriusBalances?sbr=5141&sbn=Sartorius%20Entris%20Balance.